The ability to construct biological matter from the molecule up holds promise for technologies that are set to shape our future. Synthetic biology, regenerative medicine and advanced materials are just a few of such technologies highlighted by the UK government as the 'eight great technologies' for development and investment. This promise is matched by a challenge which goes beyond the search for a better understanding of how biology works, focusing instead on how it can be replicated using synthetic and highly amenable strategies - moreover, replicated at will and for a desired function at precise time and space. A solution to this challenge can be provided by synthetic biology approaches that are becoming essential for a variety of applications, in particular for modern medicine where novel biomolecular devices that control biology in the way as nature are in steady demand. In response to this, a research team from NPL has engineered an artificial protein of about 3 nm in size, which spontaneously self-knits in water into intricate sub-millimetre nets from the molecule up. 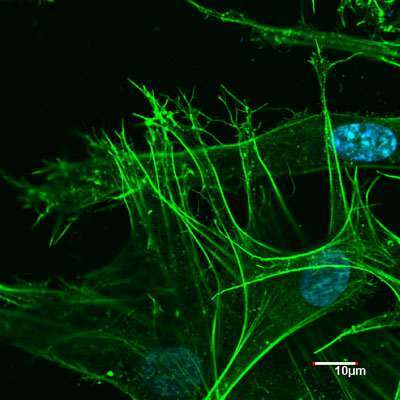 The new research, published in Journal of American Chemical Society, explains that these nets serve as extracellular matrices that are able to discriminate one class of live cells against another. Specifically, the matrices stimulated the growth and propagation of human cells while resisting bacterial colonisation and biofilm formation. The protein itself cannot support a single cell, which is tens of microns in diameter; nor does it have any bacteria-fighting properties. Only after assembling into architecturally distinctive microscopic nets does it become a highly specialised biological material. "These assembled nets remain active over a week. This would be sufficient to support healing processes in tissue and at the same time deter biofilm formation which is most critical during the first days of healing." The invention offers an exploitable rationale of structure-activity relationships, which may be useful for designing biofilm-resistant and cell-supporting 3D tissue scaffolds or 2D surface coatings.